HBO Asia’s “Folklore” is a six-episode, hour-long series that takes place across six Asian countries – Indonesia, Japan, Korea, Malaysia, Singapore and Thailand. Each episode is based on a country’s deeply-rooted myths and folklore, featuring supernatural beings and occult beliefs. The respective episodes are helmed by a director from that country and filmed locally in the country’s primary language. In the particular segment, Takumi Saitoh deals with the myth of the tatami ghost, one of the most famous Japanese “legends”. Makoto Kishi, a mute murder scene writer whose mentality is unstable to say the least, return to his home for his father’s funeral, and the past hits him quite hard with a number of shocking memories emerging in his head. At the same time, he discovers a secret door in the house that leads to a tatami room that hides a horrifying secret from his family’s past. Takumi Saitoh directs a movie that thrives on atmosphere and suspense. The fact that the protagonist is a murder scene writer and even more, that he is a mute works wonders for the film, allowing Saitoh to create a world where disorientation and the lack of knowledge of what is going is the rule, with great results for the overall, thriller essence the film emits. During the last part, this sense is completely shattered by the revealing of the events of the past and particularly the mother’s role and the father’s actions, which adds another, genuinely horror level to the movie, with the addition of the supernatural element intensifying this sense even more. The main medium for this aspect is Misuzu Kanno as the Mother, who gives a chilling and grotesque performance, which reminded me much of Hisako Ohkata’s part as Shizu Ozawa in “Guilty of Romance”. Her fittingly hyperbolic performance comes to direct antithesis with Kazuki Kitamura’s Makoto, with this difference becoming one of the best assets of the film, particularly through the chemistry the duo exhibits. Daisuke Kuroda’s performance as the father also adds to this sense, with him being the main “instrument” of violence in the film. The cinematography of the movie compliments its aesthetics nicely, implementing high contrast colors in the beginning of the film and more intense ones, where red and black dominate, during the end. The shooting of the tatami is one of the best assets, as the camera gives it a rather ominous hypostasis. The editing follows the rules of the J-horror, with the film being relatively slow for the majority of the duration, and much faster during the horror/violent sequences, again in a tactic that benefits the narrative a lot. 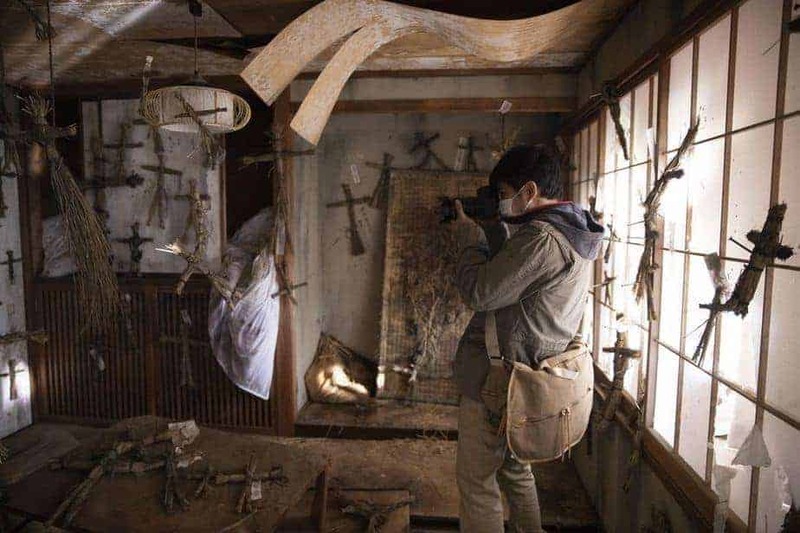 “Tatami” is a great sample of the modern J-horror, as established by Sion Sono and Takashi Miike, and a genuine proof that Saito’s directorial career is moving in the right path.